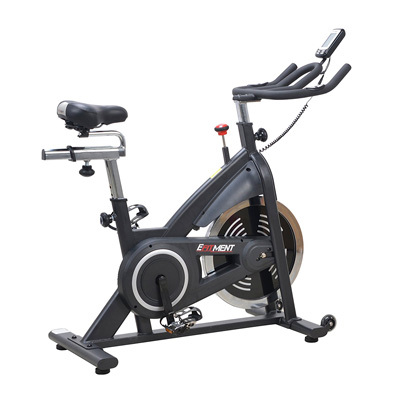 The Efitment IC014 indoor cycling bike is quite similar in specs to the Sunny SF-B1002 or the Spinner S5, but as opposed to these bikes, it comes with a fitness meter. It’s a sturdy exercise bike, made to support all spin workouts. In fact, it’s construction is pretty close to the commercial models. However, it’s far from being an expensive spin bike. As we’ve mentioned above, the Efitment IC014 features a very sturdy construction with an all-steel frame, designed to support just about any spin workout. In fact, only two parts in its construction are made of PVC material, these being the belt guard and the top flywheel and resistance pad guards. These do not play any role in the bike’s overall sturdiness, though. Thus, it can support users up to 300 lbs (136 kg) with no problem, even for the most demanding spinning workout routines. Needless to say, all the steel parts in the bike’s frame construction are double coated with a corrosion resistant powder finish. The color is dark gray, this being the only color available for this bike at the moment. However, the upright bars of the handlebars and seat have a chrome finish in order to improve the bike’s aesthetics. As opposed to other indoor cycling bikes, the Efitment bike has a metallic step-up welded into the frame right above the crank. 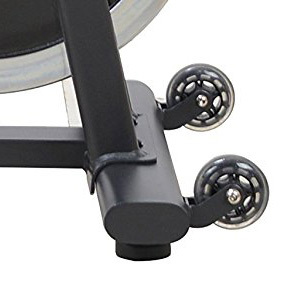 This pad offers the possibility to perform several spin workouts that require you to step-off and step onto the frame, in order to exercise different muscle groups. The bike’s frame has a low center of gravity, which means it’s quite stable. It weighs over 100 lbs and this weight plays an important role in its stability as well. Plus, both its front and rear bases integrate adjustable stabilizers with large rubber pads which give you the possibility to perfectly level it on any type of surface. The front base also has transport wheels; thus, relocating the bike once you have completed your workout is an easy task. By using the transport wheels you won’t have to handle more than ~40 lbs of the bike’s total weight. The last aspect to mention here regards the bike’s dimensions. This exercise bike is a bit longer than other models. It’s 54″ (137 cm) long and 20″ (51 cm) wide. Also, in order to be able to use it properly, without any hindrance, it’s recommended to assign at least two feet of clearance all around it. The Efitment IC014 indoor cycling trainer is equipped with a much more comfortable seat than the average, slim spin bike seat. The included saddle integrates a generous layer of padding, providing optimal comfort. It features a durable vinyl upholstery, and its attachment system to the slider is standard, so you can easily find a replacement for it if you want a different seat. The seat is 4-way adjustable, up, down, forward and back. Its upright post has 10 adjustment positions, and the horizontal slider also offers a few inches of adjustment. This being said, the bike can accommodate users between 5’0″ and 6’5″ (153 – 195 cm), offering a comfortable, healthy posture and a complete leg extension. The handlebar is only 2-way adjustable. Its upright post offers several inches of adjustment. It features a multi-grip design, with a long, loop aerobar. The side handlebars incorporate pulse sensors, so the bike’s console can track your pulse. Both the seat and the handlebar feature large adjustment knobs; thus, adjusting the bike to your own size can be done in less than a minute. The Efitment IC014 features a standard friction resistance system which involves a felt pad attached to the tension dial on the top of the middle frame bar. By tightening this knob, the brake felt pad applies more friction to the flywheel which results in a higher resistance on the pedals. The tension dial also acts as an emergency brake. It integrates a steel spring and you can quickly press it down in order to instantly stop the flywheel if needed. As opposed to exercises bike with magnetic resistance, such as the Marcy NS-40504U for example, the resistance dial of the Efitment exercise bike doesn’t have any resistance levels marked on it. You simply turn it clockwise until you obtain the satisfactory pedal tension. 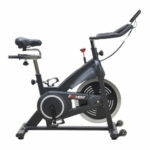 This exercise bike is equipped with a heavy, 40 lbs (18.1 kg) flywheel, designed to produce a very consistent momentum. The flywheel is perimeter-weighted, which means that it delivers a very smooth motion. It’s also bi-directional, which means you can pedal in reverse if you want. However, this is a “fixed gear” bike, so you cannot coast on it as on a road bike with a derailleur. And when pedaling in reverse, you will benefit from the same resistance, given the amount of tension generated by the resistance pad. As we’ve mentioned above, this is a heavy-duty exercise bike built for all kinds of spin workouts. 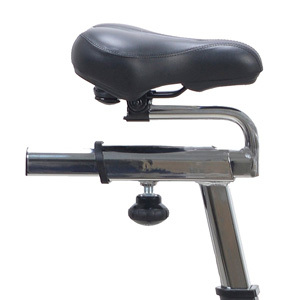 Therefore, its crank assembly is extremely durable so you can pedal while standing up on the pedals without any problem. The pedals are also highly durable, made of metallic alloy; they don’t have SPD clips for spin shoes, but do have toe cages with straps. This indoor cycling bike is equipped with a belt drive, powered by a heavy-duty belt. This belt drive comes with two main advantage. First of all, you don’t have to periodically lubricate it, and second, it generates almost no noise, so the bike’s operation is very silent. 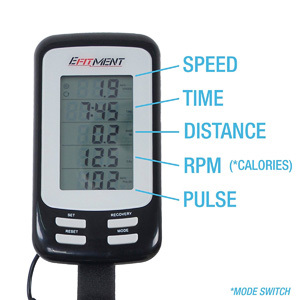 The fitness meter included with the Efitment IC014 bike offers quite a bit more than the average, basic unit. It tracks time, speed, distance, calories, RPMs, and pulse. It features a 5- panel display, which shows all the aforementioned workout metrics. In other words, you won’t have to use a SCAN function to rotate them. The RPM and calories are shown on the same (4th) panel and will alternate, though. The exercise meter unit gives you the possibility to setup countdown targets for time, distance, and calories. It also has a Pulse Recovery function which indicates your fitness level at the end of your workout. The unit is very easy to use. The SET button allows you to select a target value for time, distance or calories. The RESET button clears a selected value to zero. The MODE button serves for navigation/selection of the workout metrics, and the Pulse Recovery button initiates the recovery function. The unit has a Sleep Mode to which will enter after 4 minutes of inactivity on the bike, in order to save battery. To turn it on you simply have to press any of the buttons. It’s powered by 2 AAA batteries. Also, in case you’re wondering, it’s not telemetric; it can only track your pulse through the EKG sensors built-in the handlebars. The core of the bike comes pre-assembled. Therefore, you only have to add the base bars, the seat, the handlebars, the console, and the pedals. This shouldn’t take more than 30 min. The included manual provides clear step-by-step assembly instructions, and all the tools required for it are included. Since it’s a belt drive bike, its transmission doesn’t require lubrication. The brake pad may require lubrication, though. A silicone-based lubricant is recommended for this. Also, in case the pad wears out, it should be replaced. However, the brake pad should last for at least a couple of years, even if the bike is used frequently. Other than this, you should periodically check for loose bolts and parts. No SPD clips on pedals. 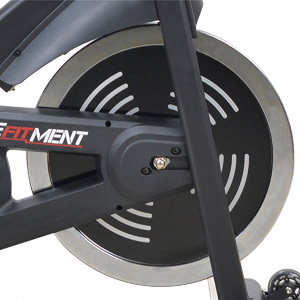 The Efitment IC014 is an indoor cycling trainer designed for all spin workouts, featuring a heavy flywheel, belt drive, and friction resistance. It also includes programmable fitness meter. It has a really sturdy construction, pretty close to commercial bikes, and a user capacity of 300 lbs. It’s an excellent trainer for light to intense cardio training, weight loss, stamina development, and intervals. And finally, since it currently costs less than $350, we can safely say that it offers an outstanding value for the price. Your review on the Efitment ICO 14 states that it is currently priced less than $300.00. However, when I try to purchase it on Amazon, the price is $329.88. Where can I purchase the bike for under $300.00? The prices vary from store to store and from a month to another. But as a general idea, the price of this bike is around $300.